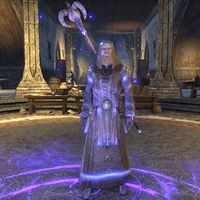 Arch-Mage Shalidor was an immensely powerful wizard in the First Era who had an understanding of magic few have ever matched, and his numerous but scattered writings are highly sought after. There are many legends surrounding Shalidor's life, such as how he built the city of Winterhold with a whispered spell, how he stole the secret of life from Akatosh, and how he single-handedly fought against the Dwemer legions of clan Rourken at the Battle of Rourken-Shalidor (in which the Spell Breaker is said to have been used). Many of these stories are believed to be hyperbole or outright fabrications. Shalidor stood at the forefront of a movement to enact higher standards among mages, and to discourage spell use among the common castes. This effort is dubiously credited with the original organization and formation of the schools of magic (Vanus Galerion is more often credited with doing this) and the foundation of the College at Winterhold. Shalidor's Insights de Shalidor — Uma disquisição da origem e natureza dos Dragões. Esta página foi modificada pela última vez à(s) 10h29min de 11 de janeiro de 2016.